Artificial intelligence, Machine learning, and Deep learning apps: how these methods are bringing a revolution in mobile app development? The three methods, artificial intelligence, machine learning, and deep learning are nestled within each other, beginning with the largest superset and then working the subsets. Deep learning is a subset of machine learning and machine learning is the subset of artificial intelligence. Artificial intelligence can be called as the superset covering both machine learning and deep learning methods. In other words, AI is both machine learning and deep learning but they do not cover the whole AI. While describing AI, John McCarthy who is called one of the godfathers of AI said that it is the science and engineering of making intelligent machines. Artificial Intelligence is nothing but a branch of computer science which deals with the simulation of intelligent behaviours in computers. It makes a machine capable enough to imitate human behaviour. The machine powered by AI is able to perform tasks which require human intelligence such as visual perception, speech recognition, decision-making and translation of languages. Know how AI, Mobile Learning & Deep learning methods are bringing a revolution in mobile app development? Machine learning is nothing but a field of study that gives computers the ability to learn without being exactly programmed. The machine learning programs are not entered into a computer like the coding statements. They adjust themselves to the data that is exposed to them. It is just like how a child knowing nothing slowly adapts to the world. Arthur Samuel, a pioneer of machine learning started with teaching the computer to play checkers. He wanted it to master the game and in 1962, the computer program was able to beat the champion of the state of Connecticut. The learning is nothing but the ML algorithms which attempt to optimize along a particular dimension. They try to minimize errors or maximize the likelihood of the predictions being true. It is called an error function, a loss function or an objective function because of the algorithm being written with a certain objective. The next question that comes to mind is how does it minimize error? One way to achieve this is by building a framework that multiplies the inputs in order to make guesses as to input’s nature. A similar concept is applied in the neural networks. They measure and modify the parameters until the error obtained can’t be lesser. These are called optimization algorithms. Examples of machine learning apps: Snapchat filters, Netflix, Tinder, Oval Money, Leaf Snap, Dango, etc. Usually, when people refer to deep learning, they refer to deep artificial neural networks. As discussed, deep learning is a subset of machine learning. Deep artificial neural networks are a set of algorithms that provide accurate results for problems such as image recognition, sound recognition, recommender systems, etc. Deep learning network has multiple hidden layers which allow deep neural networks to learn features of the data in a so-called feature hierarchy. Computational intensity is one of the characteristics of deep learning. It is also a reason for the GPUs to be in demand to train deep-learning models. Examples of deep learning app: Voice assistants and voice search, healthcare apps for diagnosis, Image recognition, automatic colourization, etc. The advancements made by researchers at DeepMind, Google Brain, OpenAI and other universities is gaining pace. There is no doubt about the capability of AI in solving harder problems and better than humans. Most predictions related to AI become out of date with the speed of its change. The mainstream mobile app development is being reshaped by the new innovative and inventive technological advancements. This revolution comes in an even more fast-paced and user-centric direction. The coming years surely hold extremely promising trends for the apps and machines powered by artificial intelligence and machine learning. The hints of this trend can be seen in the form of chatbots and augmented and virtual reality. But the overall progress and trends depict artificial intelligence (AI) as the center of the revolution. There has been a huge customer demand for the prompt, real-time access to content which has further fueled the growth in the use of this technology. 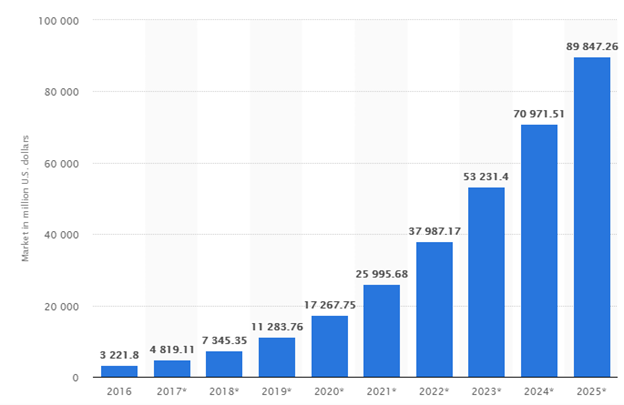 According to a report in Statista, the global market value of AI is expected to exceed over 89 billion US dollars by the end of the year 2025. The chatbots, voice over speech recognition, augmented reality are precisely tailored advancements for artificial intelligence apps and machine learning apps. The face detection technology enables the apps to detect faces with 98% accuracy. It is most useful for the security purpose and can be used by the companies for their security-based tracking apps to verify the user’s face in order to protect confidential data, detect license plates and even unlock the phones. According to the latest updates, the face detection feature can also be used to pay for the credit cards without having to swipe the cards. Artificial Intelligence and machine learning apps have made it possible for users to search not just via text but also images and voice. Most businesses are trying to integrate voice recognition in their ai assistant apps. Integrating app localization and image recognition has taken user experience to the next level thus increasing the conversion rate. Using AI, you are able to detect the particular points in an image. It can read the various radiology pictures and is able to find the natural and the artificial structures within an image. Image recognition can be very useful in identifying a photo as a landmark against its geolocation data. Using Ai apps researchers are able to put more focus on instance- level and fine-grained recognition issues rather than playing around general entities. At Coruscate, we have a team of expert developers who have a sound knowledge of artificial intelligence and machine learning. We have developed over 200 apps based on this technology and delivered successful results. Our chatbots and authentication systems delivered to clients are doing great and have helped the clients to grow their business. You can read about these apps in our case studies and blogs. If you are looking for a mobile app development company who can help you in developing an artificial intelligence based app, connect with us for a free consultation and we like our other clients, you too can benefit with our innovative technology.